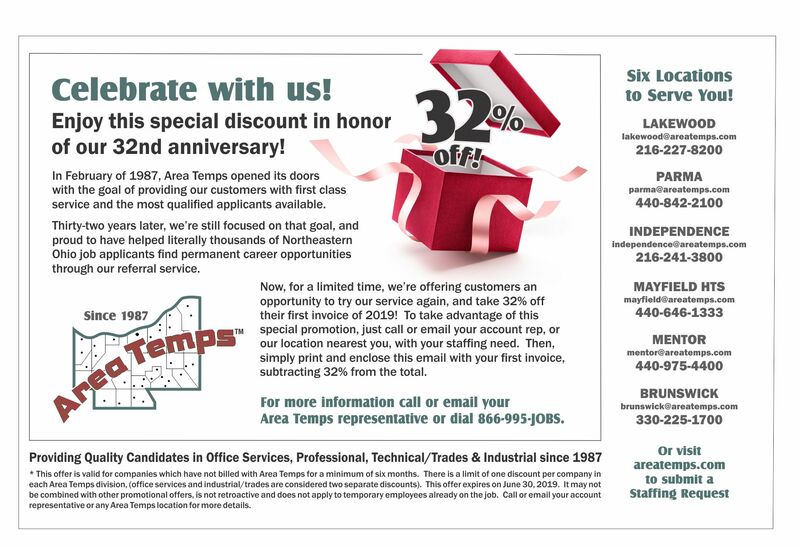 We are celebrating 32 years of providing quality service to our customers, and we would like you to join in the fun with our latest offer! New customers may take 32% off of their first invoice! Act quickly…this offer is valid for a limited time. Keep in mind, Area Temps is dedicated to uncovering the top talent available in today’s challenging job market. With six locations throughout Northeast Ohio and 23 full-time recruiters, we interview more than 300 local applicants each week! Regardless of whether you need clerical, light industrial, skilled trades or professional candidates, there is a good chance we have the right person for you in our extensive database. Please contact us with your staffing requirements, and we’ll demonstrate how our proactive approach is the best way to find your next employee.